Online display advertising is an effective method for adding digital reach to other direct marketing programs like direct mail. But what if your campaign calls for reaching specific households at the rooftop level? Do you have a customer address list from a loyalty program that you would like to reach with digital display? How about a list of lapsed customers that you would like to promote to with an offer to return? Direct IP Targeting is the answer. Hyper targeted digital display delivered at the rooftop level that allows you to create custom campaigns for specific targeted audiences. No more wasted coverage. 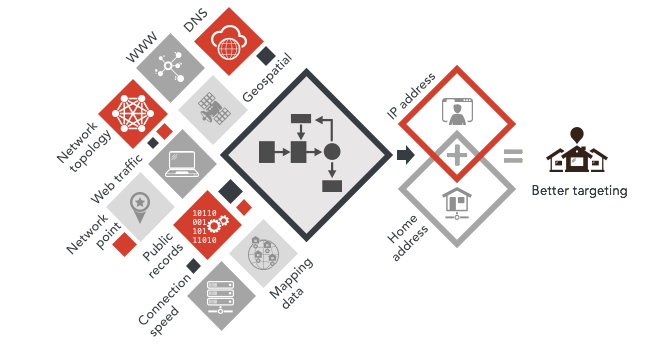 A patent pending process combines more than 30 public data elements to hyper-accurately map an IP address to a home address. Ideal for loyalty campaigns to existing customers or remarketing to lapsed customers. Target only existing customers with a loyalty offer or lapsed customers with an incentive to return. Fully customizable, allowing you to precisely control start and end dates of your campaign, the number of impressions served to your audience and the day part and day of week the ads are served. Perfectly complements a direct mail campaign by adding digital reach at the rooftop level to the same households that receive a direct mail piece. Competitive targeting available to serve your digital advertising directly to customers of your competitors while they are logged in to local wifi. Contact your salesperson at 404-973-2770 or send us an email for more information.